There are occasions when large files need to be sent via email. 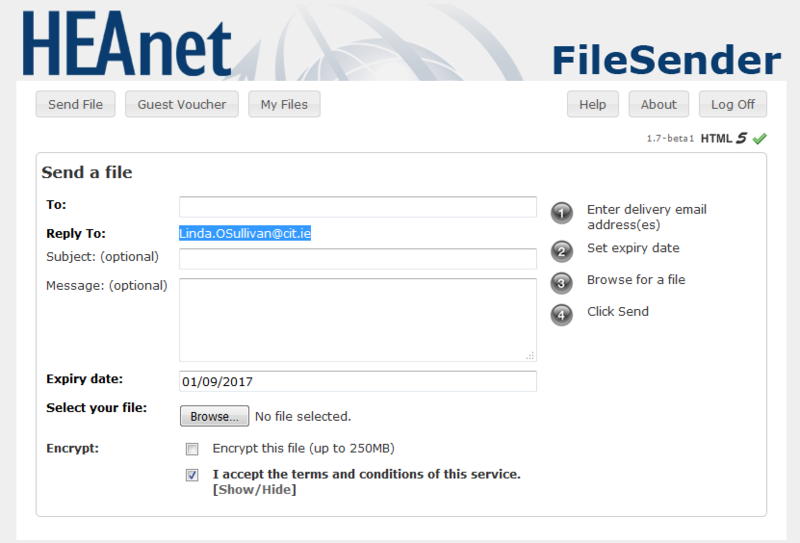 There is a limit to the size of such attachments and staff are encouraged to use HEAnet’s FileSender to email large files. Click Logon and choose your home organisation to login to HEAnet FileSender. Then login with your CIT username and password. Insert the email address of the person you wish to send the file to and browse to find and upload the file you wish to send. Only one file can be sent at a time, therefore it is advisable to use file compression software, such as 7-Zip, WinZip, or Win RAR, to compress a folder of files if you need to send many files or send executables.